We went to meet the famous Argentine designer in his Milan studio to learn more about his opinion on the evolution of design and to offer our readers the chance to know more about one of the "fathers" of current design. I started designing long before my schooldays. My first boat was launched in '57 when I was 16 years old. My father was a great sailing enthusiast and had started designing boats almost as a hobby. 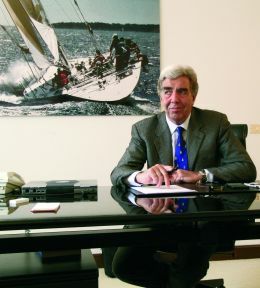 Then it became a job and a big business success: production of numerous boats was started in Argentina, a bit far away from the most commercially interesting part of the world. That was in the 20's, 30's and 40's and Argentina was economically strong, wealthy and there was a lot of activity. The slump came afterwards. How much has the evolution of materials contributed to design development? Evolution of materials has given us the chance to develop new designs. Modern materials give us greater design freedom, because being tougher and lighter we can use them to design lighter and tougher boats. So there's a wider choice even at the design stage. Designs have undergone an important evolution, and planning is now based on increased awareness of the forces involved, of the specific toughness of each individual material and component. This is also due to the advent of computers. Today's projects are far more accurate and detailed. We as a design studio invest a lot of resources in technology because the result is seen in the quality of the projects in terms of performance and comfort. Some say our designs cost more than others', but the reason lies in the work of development and research that our two studios - the one in Argentina and this one in Milan - carry out every day. Do you feel tank tests are a useful aid? Certainly. For example, today my son's in Sweden, at the Swedish test tank, for Volvo 70 trials. It's the same tank that was set up for the last America's Cup challenge and is especially suitable for sailboat tests. We always do these tests on racing boats such as those for the Volvo race or the America's Cup, but also on some superyachts. Yes, at that time it was obligatory to do tests in the boat's country of origin. But they gave good results with view to research, and the tank was well equipped. Tank tests are important because they help us to validate the results processed on the computer as well as the boat's behaviour in the various situations which may be simulated by models. Do you use computer assisted design also in seeking interior solutions? Yes, though we don't do a great deal of interiors. It all depends on the kind of boat. For small boats we do everything here, but the bigger the boat the more likely it is that an interior designer will be brought in with whom we do our best to work together. Yes, I'd say that you start with the dream, which we must interpret and translate into something that works, that is valid and also capable of giving its owner everything he seeks, over and above performances and the purely stylistic aspect. As for development of sail plans, is it always the owner who asks for sloop or ketch rig for example? In general they listen to our advice, though obviously there are cases in which the owner is more expert than others and has his own ideas. For example, on a 50/60 metre vessel I would prefer ketch rig, but many prefer sloop. The high mast, in my opinion, satisfies a purely psychological question. Do today's new materials mean that very tall masts can be built? The materials permit it but wind and sea must be respected. These are things that are made, but though they are efficient I don't feel them to be very logical. The sloop rig is certainly more efficient but I believe that in the future, over the next 20 years perhaps, technology will bring us possibilities that are certainly more interesting. For example there is already talk about the disappearance of standing rigging and about single sail rigs, very efficient. What do you think has been the most important technical aspect in recent years, the main evolvement? We can find evolution throughout. I feel that boats shouldn't all be the same. The shape of the hull, the way of sailing, depends a lot on detail, because you can't apply a certain solution to just any old boat. This concept is now much clearer to everybody because we can now evaluate the responses of the structures before building the boat. 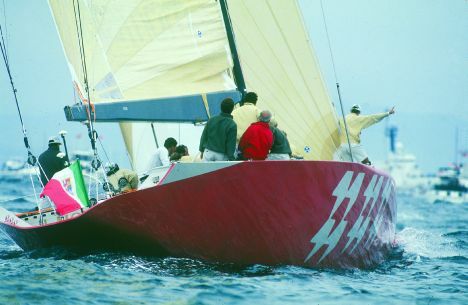 For example, with a cruising sailboat it is best if it doesn't heel more than 15° under way, but with a racer the angle may become 25-27°, so the shapes are different and we can no longer continue, as in the past when there were many unknown quantities, to base large and small vessels on the same lines. How much has deck design changed and what's the trend? The trend is towards automation because modern boats are big and you can't do everything by hand. There's been a great revolution with hydraulic and electronic systems. 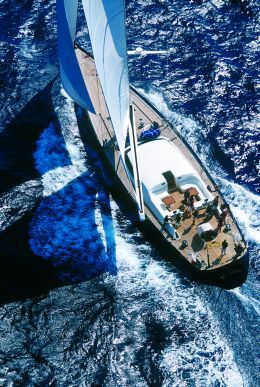 We ourselves developed a piston that controls the sails. Initially we installed it on smaller boats. The system greatly facilitates handling the boat under cruise conditions since a large crew is not required. This is a very important aspect, especially considering the management costs of large size boats. What's the trend from the specifically aesthetic angle? I think today there's more freedom in the choice of one line rather than another, there isn't a fashion to follow. We design highly modern boats and neoclassical boats. Today the most modern ones are starting to resemble the classic, purer in both line and form. Taste has changed a lot. Some years back even small boats were made with interiors suitable for round the world sailing, but now owners have another concept and ask us for boats like 80 foot cruisers suitable for both day sailing and long voyages. So we can aim much more on performance, offering boats that are lighter and more fun. And as for hull development? It's the same story. With instruments for designing something down to the tiniest detail and with the possibility of evaluating the hydrodynamic and mechanical responses at the planning stage we can develop projects that are increasingly closer to the customer's requirements. If a boat is to be used mainly for racing, very precise choices will be made that put the emphasis on performances and manoeuvrability, whereas a cruising vessel will involve different choices more aimed at comfort. Boats are designed also in function of the wind conditions they may be expected to meet. How do you manage to adapt designs to the specific conditions the boat may come up against in the future? That's the secret of design and planning: it isn't a compromise but a work of specialisation. For example a customer recently asked me for a boat that was as fast as possible but could also pass under the Panama bridge. In such cases you obviously have to seek the best solution, the combination of elements that permit reduced weights and high performance, and then combine everything with the physical requirements expressly requested by the customer. Composite materials help us greatly in this. What are the limitations of steel, aluminium and composite? I wouldn't say there are limitations: steel is a material I don't like for boats because it's very heavy. A 60/70 metre boat today is in composite. I see no reason to use steel, also because the cost difference is about 10% of the total. I love aluminium and composite, but it depends a lot on the country you build in. You make a study, you present it and then you choose. I could design the best possible boat, but if the builder doesn't understand what I want then it's a waste of time. That's why we have a fairly short list of boatyards. Who do you mainly work with, who are your partners? Nautor, Hallberg Rassy for series models, Wally Yachts for one-off boats; then there's Huismann in Holland, some boatyards in Germany and Barcos Deportivo in Spain. I've worked a lot with Huismann, since 1977. We built "Flyer", the boat for Von Karajan, the "Lady Sara" and we've worked with French boatyards on the latest "Only Now", with composite hull, which won a megayacht prize. Now we're working in New Zealand, in particular with Ian Cook's Development with which we built "Ipanema". 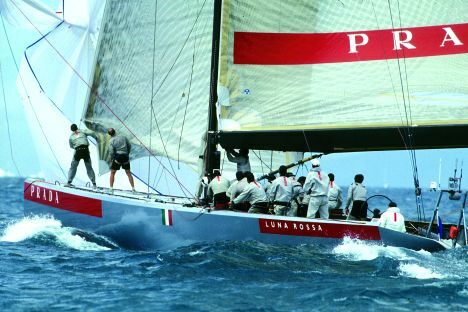 Speaking of New Zealand, and the fact that everybody knows you as an America's Cup designer after "Moro di Venezia" and "Luna Rossa": what about the future? This time it will be a very costly business for the teams to succeed in winning. There aren't many syndicates with sufficient funds to face such an extreme challenge. We've been involved with various groups, but also the international political situation conditions things somewhat. We also have to consider that there's no sense in taking part in the America's Cup if you've got no chance of winning the final. That's the America's Cup game: in a certain way it's bloody, there's only one winner, and going there just to take part has no sense. So who do you see as the favourite? Definitely Alinghi. They'll be able to run the game the way they want, it's very different from how it used to be, and it won't be easy to get the cup away from them. In the design of America's Cup hulls what, in your opinion, was the variable that gave victory to Alinghi? The America's Cup is both a design and a management game. For successful design you need very intelligent management, and with this word I intend everything. I think Bertarelli did a fantastic job, he knew where to spend and not to spend, knew what was true and what wasn't, and he didn't trust anybody. In a team of 150 there's always a political part which may ruin it. It may help but may also ruin it. There are always personal interests. Generally all the participants have a fairly strong ego, and if someone is sponsor or is heading the team he is inevitably involved in ego and personality games. The return in terms of image is highly important: we may mention for example Prada, a brand name which, since the first challenge, has very clearly increased its fame worldwide. Do you feel that the new race venue in Spain implies design modifications for the boats involved? Conditions in Spain are highly predictable, so the races will be very similar and the boats optimised to the full for these well known conditions. From the viewpoint of the race I would have much preferred Portugal. It would have been more fun, but being in the Mediterranean is important because it means that there will be lots of people. I hope there will be good competition. About 20 groups have enrolled but we'll have to see who proceeds with a serious project. Let's go back to talk about your studio. How is the structure organised? Here in Milan we design and carry out research, exactly as we do in Buenos Aires. German Jr. and I are 50% partners. The boat I have in mind I could do here or in Buenos Aires, it's the same company. We stayed on in Milan after work on the "Moro di Venezia" because there's a certain link with Italy and it's also very important for us to be present in Europe. My son won't be going back permanently to Argentina, he's decided to commute. How long does a boat project last? As regards working time, about six months, but somewhat longer including time for reflection. We may do 15/20 projects a year and we have to look at time management. Initially we organise a briefing with the future owner where he explains exactly what he wants, then we step in with very precise choices, obviously depending on the type of boat. If it's a racer it's all ours, while in other cases the owner is involved in a more marked way, but it depends on his personality. I like to work with an expert and I like to have carte blanche, because the options are many and you have to decide. It's like designing a boat for yourself. How would you design a boat for yourself? Modern, fast, beautiful and comfortable. 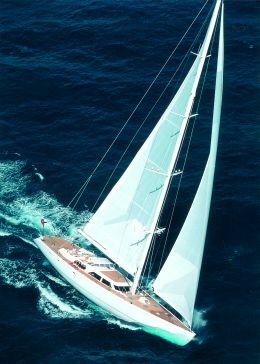 I believe the secret of success is to offer a boat that gives you the pleasure of voyaging under sail. This is part of the game. The problems are very similar to sailboat problems, which is to say toughness, weight and power. Engines are sometimes far more reliable than sails: let's say they're less variable. I really like creating rather special designs, although you do need an owner who understands, otherwise everything goes on well known brand names, which are nevertheless highly valid. Are you currently designing a motorboat? Yes, a 24 metre semi-displacement boat with a very elegant deck. A different sort of boat, high performance but elegant and also comfortable. It will definitely be produced in a small series. I mean it will be innovative in both its technical and stylistic aspects and aimed at a market segment that I feel has not yet been well developed. Performances are taking on increasing importance. The bigger the boats get, the more the owners appreciate speed. This is also because time is a precious commodity, but I actually prefer to think that it is like the pride the sea captains of old had in their vessels' speed. You also designed Gianni Agnelli's "Stealth". How was your relationship with him? Extraordinary. He was a very well informed and very intelligent person. He liked the sea and sailing. The only thing he said was: "I want a boat for the pleasure of sailing. It will be black and be called Stealth". And you were given carte blanche? No, it was very easy. The only problem was that he wanted it finished in a short time and, to avoid speculation, didn't want anybody to know about it. Since you were given carte blanche, might we say that "Stealth" somewhat approaches your ideal boat? It's one of my favourites, because it's pure.